7' Standout. Easy Readability with 1" Wide Blade. Entire Blade Coated with Mylar Polyester Film For Added Durability. Heat Treated Spring Stands Up To Repeated Use. 16" and 19.2" Stud Center Markings Simplify Framing Jobs. Designed for quick, reliable measuring on the job or at home. Easy-to-use squeeze-lock blade return. 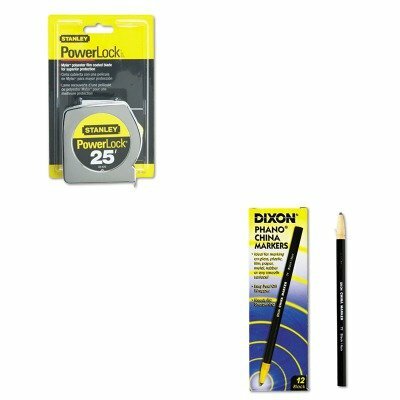 Yellow steel blade remains rigid up to 7 ft. High-contrast blade markings for easy readibility. Graduations on top edge in 1/16""; on bottom edge in 1/32"" for first foot then 1/16"". High-impact, high-visibility yellow plastic case. Hook moves to allow accurate inside/outside measurements. Tape Measure Type: Locking Rule; Blade Length: 25 ft; Scaling System: Standard; Blade Material: Steel. Designed with the professional in mind. Secure lock helps prevent blade from creeping. Includes 16"" and 19.2"" stud center markings. Special Tru-Zero hook does double-duty as a pivot for drawing circles and arcs. Three-rivet, corrosion-resistant hook moves for accurate inside/outside measurements. 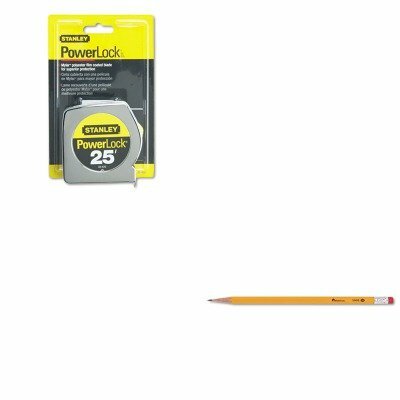 High-visibility yellow steel blade remains rigid up to 7 ft. and is coated with Mylar for durability. Extra-tough chrome case with belt clip for easy portability. Tape Measure Type: Locking Rule; Blade Length: 25 ft; Scaling System: Standard; Blade Material: Steel. lt;stronggt;BOS33425lt;/stronggt;lt;BR/gt;Powerlock II Power Return Rule, 1quot; x 25 ft., Chrome/Yellowlt;BR/gt;Designed with the professional in mind. Secure lock helps prevent blade from creeping. Includes 16amp;quot; and 19.2amp;quot; stud center markings. Special Tru-Zero hook does double-duty as a pivot for drawing circles and arcs. Three-rivet, corrosion-resistant hook moves for accurate inside/outside measurements. High-visibility yellow steel blade remains rigid up to 7 ft. and is coated with Mylar polyester film for durability. Extra-tough chrome case with belt clip that makes portability easy. 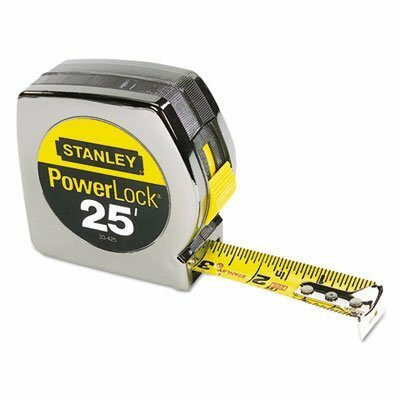 Tape Measure Type: Locking Rule Blade Length: 25 ft Scaling System: Standard.lt;BR/gt;lt;BR/gt;lt;stronggt;CRW2230Rlt;/stronggt;lt;BR/gt;Powerlock II Power Return Rule, 1quot; x 25 ft., Chrome/Yellowlt;BR/gt;Provides a wide, unobstructed field of vision and can be worn with most half-mask respirators. Transparent PVC body permits a comfortable fit over glasses. Protects against impact, splash. Indirect vented. 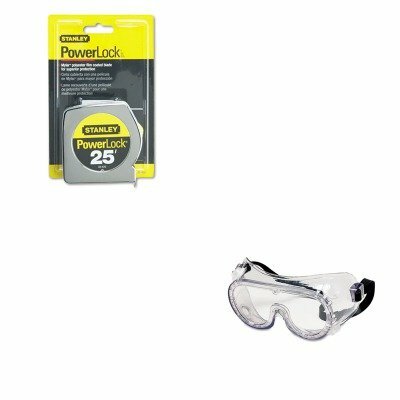 Transparent protective PVC body permits a comfortable fit over prescription eyewear while protecting against impact and splash. Materials: PVC. lt;stronggt;BOS33425lt;/stronggt;lt;BR/gt;Powerlock II Power Return Rule, 1quot; x 25 ft., Chrome/Yellowlt;BR/gt;Designed with the professional in mind. Secure lock helps prevent blade from creeping. Includes 16amp;quot; and 19.2amp;quot; stud center markings. Special Tru-Zero hook does double-duty as a pivot for drawing circles and arcs. Three-rivet, corrosion-resistant hook moves for accurate inside/outside measurements. High-visibility yellow steel blade remains rigid up to 7 ft. and is coated with Mylar polyester film for durability. Extra-tough chrome case with belt clip that makes portability easy. 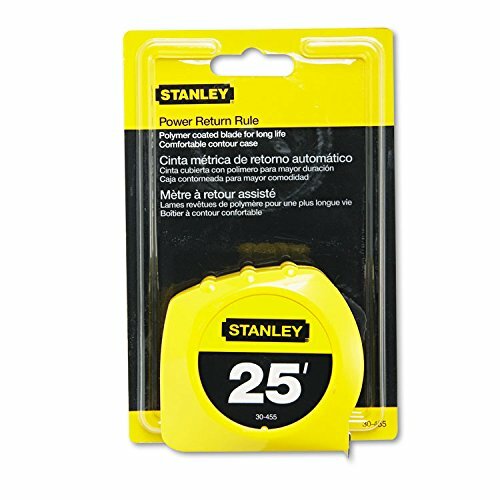 Tape Measure Type: Locking Rule Blade Length: 25 ft Scaling System: Standard.lt;BR/gt;lt;BR/gt;lt;stronggt;CRWV201Rlt;/stronggt;lt;BR/gt;Powerlock II Power Return Rule, 1quot; x 25 ft., Chrome/Yellowlt;BR/gt;Bright orange color and reflective strips provide high visibility day or night for a variety of hazardous situations. Lightweight polyester mesh fabric with hook and loop closure keeps vest secure in all weather conditions. One size, 18amp;quot; x 47amp;quot;, with 8amp;quot; elastic side straps. Apparel Type: Vest Materials: Polyester Mesh Colors: Bright Orange/LimeSilver Reflective Strips. lt;stronggt;BOS33425lt;/stronggt;lt;BR/gt;Powerlock II Power Return Rule, 1quot; x 25 ft., Chrome/Yellowlt;BR/gt;Designed with the professional in mind. Secure lock helps prevent blade from creeping. Includes 16amp;quot; and 19.2amp;quot; stud center markings. Special Tru-Zero hook does double-duty as a pivot for drawing circles and arcs. Three-rivet, corrosion-resistant hook moves for accurate inside/outside measurements. High-visibility yellow steel blade remains rigid up to 7 ft. and is coated with Mylar polyester film for durability. Extra-tough chrome case with belt clip that makes portability easy. 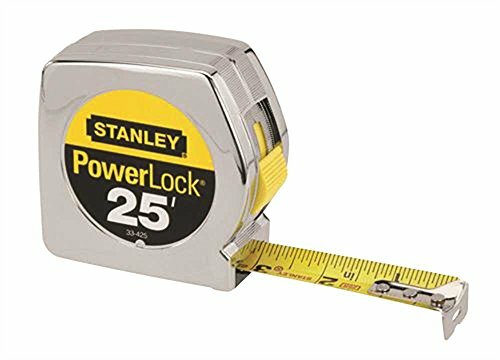 Tape Measure Type: Locking Rule Blade Length: 25 ft Scaling System: Standard.lt;BR/gt;lt;BR/gt;lt;stronggt;BOS92680lt;/stronggt;lt;BR/gt;Powerlock II Power Return Rule, 1quot; x 25 ft., Chrome/Yellowlt;BR/gt;Ultra-compact for handy portability. Water-resistant zippered case securely holds a variety of tools for home and office. Includes 12-ft. tape rule, 8amp;quot; torpedo level, 7-oz. wood claw hammer, picture hanging fasteners, two screwdrivers 4amp;quot; standard and 2 Phillips head, 4amp;quot; long nose pliers, and 6amp;quot; slip joint pliers. 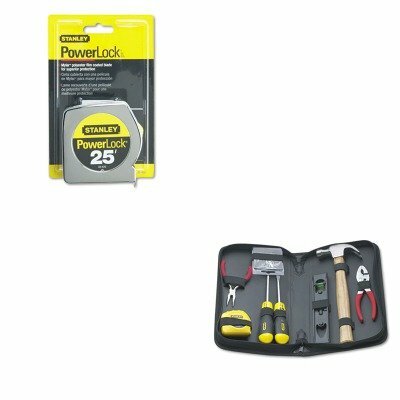 Tool Kits Type: General Repair Number of Pieces: 7.
lt;stronggt;BOS33425lt;/stronggt;lt;BR/gt;Powerlock II Power Return Rule, 1quot; x 25 ft., Chrome/Yellowlt;BR/gt;Designed with the professional in mind. Secure lock helps prevent blade from creeping. Includes 16amp;quot; and 19.2amp;quot; stud center markings. Special Tru-Zero hook does double-duty as a pivot for drawing circles and arcs. Three-rivet, corrosion-resistant hook moves for accurate inside/outside measurements. High-visibility yellow steel blade remains rigid up to 7 ft. and is coated with Mylar polyester film for durability. Extra-tough chrome case with belt clip that makes portability easy. Tape Measure Type: Locking Rule Blade Length: 25 ft Scaling System: Standard.lt;BR/gt;lt;BR/gt;lt;stronggt;DIX00077lt;/stronggt;lt;BR/gt;Powerlock II Power Return Rule, 1quot; x 25 ft., Chrome/Yellowlt;BR/gt;Ideal for marking on glass, plastic, film, and most surfaces. Easily wipes away clean from smooth surfaces. Paper-wrapped with tear string sharpening. Colors: Black. lt;stronggt;BOS33425lt;/stronggt;lt;BR/gt;Powerlock II Power Return Rule, 1quot; x 25 ft., Chrome/Yellowlt;BR/gt;Designed with the professional in mind. Secure lock helps prevent blade from creeping. Includes 16amp;quot; and 19.2amp;quot; stud center markings. Special Tru-Zero hook does double-duty as a pivot for drawing circles and arcs. Three-rivet, corrosion-resistant hook moves for accurate inside/outside measurements. High-visibility yellow steel blade remains rigid up to 7 ft. and is coated with Mylar polyester film for durability. Extra-tough chrome case with belt clip that makes portability easy. Tape Measure Type: Locking Rule Blade Length: 25 ft Scaling System: Standard.lt;BR/gt;lt;BR/gt;lt;stronggt;UNV40304lt;/stronggt;lt;BR/gt;Powerlock II Power Return Rule, 1quot; x 25 ft., Chrome/Yellowlt;BR/gt;High-capacity clip lets you get a grip on large stacks of paper. Durable construction. 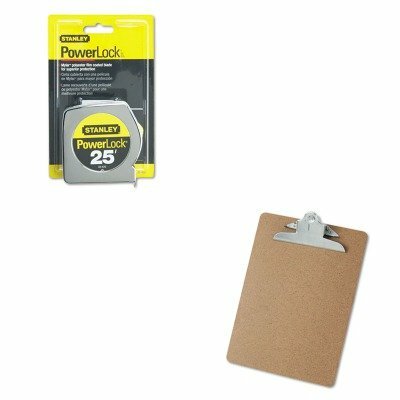 Holds Paper Size: 8 1/2 x 11 Clipboard Actual Size: 9w x 13h Clipboard Material: Hardboard. lt;stronggt;BOS33425lt;/stronggt;lt;BR/gt;Powerlock II Power Return Rule, 1quot; x 25 ft., Chrome/Yellowlt;BR/gt;Designed with the professional in mind. Secure lock helps prevent blade from creeping. Includes 16amp;quot; and 19.2amp;quot; stud center markings. Special Tru-Zero hook does double-duty as a pivot for drawing circles and arcs. Three-rivet, corrosion-resistant hook moves for accurate inside/outside measurements. High-visibility yellow steel blade remains rigid up to 7 ft. and is coated with Mylar polyester film for durability. Extra-tough chrome case with belt clip that makes portability easy. Tape Measure Type: Locking Rule Blade Length: 25 ft Scaling System: Standard.lt;BR/gt;lt;BR/gt;lt;stronggt;UNV55400lt;/stronggt;lt;BR/gt;Powerlock II Power Return Rule, 1quot; x 25 ft., Chrome/Yellowlt;BR/gt;Economic pencil delivers first-rate quality at an affordable price for all your writing needs. Soft lead provides a smooth writing experience every time. Hexagonal barrel fits nicely into your hand and won't roll off tables or desks. Pencil Type: Woodcase Lead Colors: Black. lt;stronggt;BOS33425lt;/stronggt;lt;BR/gt;Powerlock II Power Return Rule, 1quot; x 25 ft., Chrome/Yellowlt;BR/gt;Designed with the professional in mind. Secure lock helps prevent blade from creeping. Includes 16amp;quot; and 19.2amp;quot; stud center markings. Special Tru-Zero hook does double-duty as a pivot for drawing circles and arcs. Three-rivet, corrosion-resistant hook moves for accurate inside/outside measurements. High-visibility yellow steel blade remains rigid up to 7 ft. and is coated with Mylar polyester film for durability. Extra-tough chrome case with belt clip that makes portability easy. Tape Measure Type: Locking Rule Blade Length: 25 ft Scaling System: Standard.lt;BR/gt;lt;BR/gt;lt;stronggt;BICGSM11BKlt;/stronggt;lt;BR/gt;Powerlock II Power Return Rule, 1quot; x 25 ft., Chrome/Yellowlt;BR/gt;The economical choice for performance and reliability. Colorful frosted cap and translucent barrel for visible ink supply. Flexible round barrel for writing comfort. Long-lasting: more than 7,200 feet of writing in each pen. Pen Style: Stick Ink Colors: Black. lt;stronggt;BOS33425lt;/stronggt;lt;BR/gt;Powerlock II Power Return Rule, 1quot; x 25 ft., Chrome/Yellowlt;BR/gt;Designed with the professional in mind. Secure lock helps prevent blade from creeping. Includes 16amp;quot; and 19.2amp;quot; stud center markings. Special Tru-Zero hook does double-duty as a pivot for drawing circles and arcs. Three-rivet, corrosion-resistant hook moves for accurate inside/outside measurements. 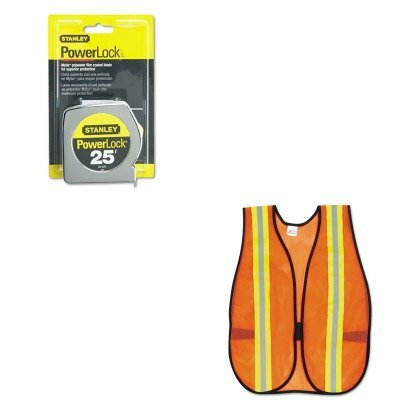 High-visibility yellow steel blade remains rigid up to 7 ft. and is coated with Mylar polyester film for durability. Extra-tough chrome case with belt clip that makes portability easy. 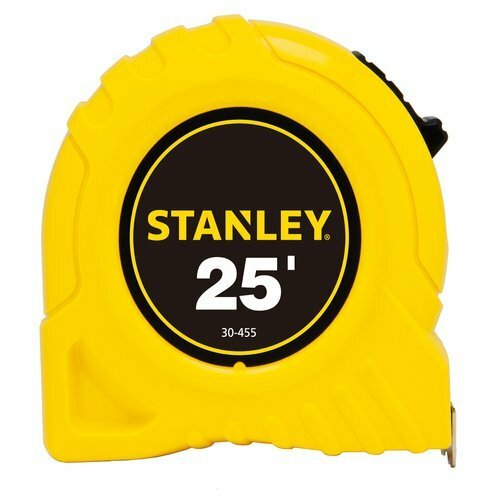 Tape Measure Type: Locking Rule Blade Length: 25 ft Scaling System: Standard.lt;BR/gt;lt;BR/gt;lt;stronggt;SAN30001lt;/stronggt;lt;BR/gt;Powerlock II Power Return Rule, 1quot; x 25 ft., Chrome/Yellowlt;BR/gt;This fine tip permanent marker is the original Sharpie. Permanent on most hard-to-mark surfaces. Quick-drying ink is waterproof, smearproof and fade-resistant. Marker Type: Permanent Assortment: N/A Colors: Black Tip Type: Fine.